"No one understands what cancer patients go through until you go through it yourself." I was diagnosed October 26, 2017 during my freshman year of college. By my birthday on January 30, I already had two surgeries, countless IV pokes and so many chemo treatments. After a few months, I was unable to walk due to a tumor on my spine pushing on my nerves.So many people think that Melanoma is just a freckle you get removed and never think about again. The truth is, melanoma can be deadly if it’s caught too late! Melanomas life expectancy is three to six months. 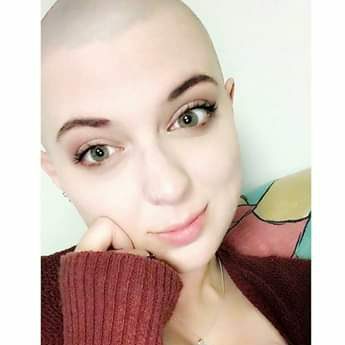 Cancer is terrifying! No one understands what cancer patients go through until you go through it yourself. It is not all colorful t-shirts and relay walks. It’s nights nearly falling asleep by the toilet because you can’t stop throwing up, it’s having your best friend shave what’s left of your hair off in your dorm room, it’s calling your boyfriend after his class telling him you don’t want to go on like this. It’s hurting every night, not being able to type, write or even talk on the phone too long because you’re in so much pain. Cancer takes up all of your time, and energy. It hurts not only you but those around you. My mother slept by my side constantly through hospital stays and down recovery road! My boyfriend FaceTimed me every night and called me beautiful, prayed for me and stayed by my side through the whole last year.